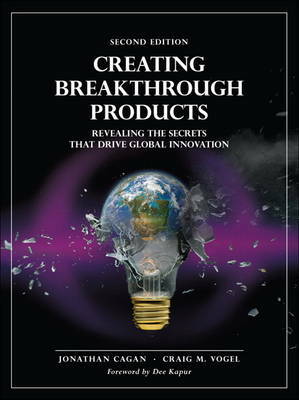 For years, Jonathan Cagan's and Craig M. Vogel's Creating Breakthrough Products has offered an indispensable roadmap for uncovering new opportunities, identifying what customers really value, and building products and services that redefine markets - or create entirely new markets. Now, the authors have thoroughly updated their classic book, adding new chapters on service design and global innovation, plus new insights, best practices, and case studies from both U.S. and global companies. Their new Second Edition compares revolutionary (Apple-style) and evolutionary (Disney-style) approaches to innovation, helping decision-makers choose between them, and make either one work. Cagan and Vogel provide more coverage of Value Opportunity Analysis and ethnography, as well as new case studies ranging from Navistar's latest long-haul truck to P&G's reinvention of Herbal Essence. Throughout, readers will find up-to-date insights into identifying Product Opportunity Gaps that can lead to enormous success; navigating the "Fuzzy Front End" of product development; and leveraging contributions from diverse product teams - while staying relentlessly focused on customers' values and lifestyles, from strategy through execution. Using additional visual maps and illustrations, they've made their best-selling book even more intuitive and accessible to both industry and academic audiences.